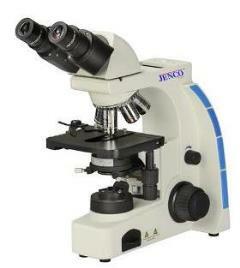 We are convinced that our Microscopes are the best in the marketplace and at the right price. The BK Series (replaces JC, PL, CK, Z7, and ZM Series) Upright Compound microscopes are designed to perform in a demanding research environment and incorporates advanced technology into a durable, cost effective solution for your microscope needs. EMS introduces a high optical standard on a versatile frame at budget conscious levels. The long working distance condenser (55 mm) and objectives (six supplied) provide brilliant resolved images in both phase contrast and brightfield techniques. The condenser swings out to accommodate roller bottles or other large cultivation vessels. Eye pieces - 10X, Focal Length 25mm, FN 20 mm. 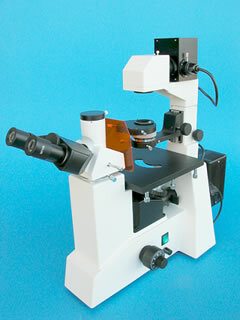 Microscope Includes: phase centering telescope and phase annulus sliders, dust cover, color filters (blue green and frosted), spare halogen lamp and fuse. The EMS Epi-fluorescence Inverted Microscope allows you to quickly locate fluorescent tagged items and save room in your budget. The BC Series Epi Inverted uses a single band filter cube and six objectives to deliver a brightly resolved image for identifying proteins and other specimens within a cell. Eye pieces - 10X; Focal Length 25mm, FN 20 mm. EMS offers three types of camera systems for documenting resolved microscopic images. Note: CCD cameras and cooled CCD cameras for fluorescence available upon request. 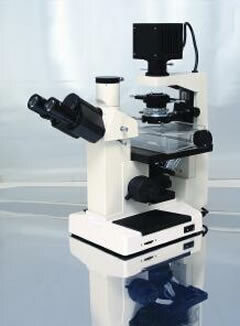 EMS also offers the complete line of Digital Microscopy Cameras by Lumenera: Infinity Digital Microscope Cameras.